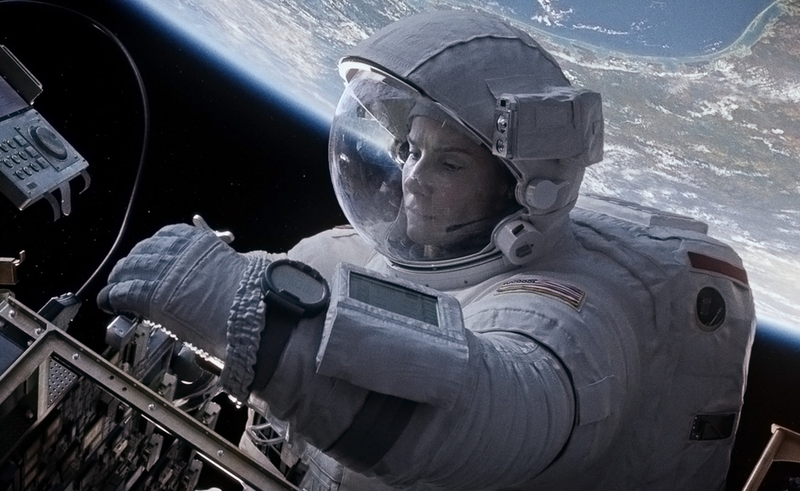 Warning: This article contains discussion of major plot points in Gravity, including the ending. Noel: From the moment Gravity started screening at festivals and at critics’ previews a month ago, I started seeing some of the most rapturous responses I’ve ever seen to a motion picture, with people raving over its narrative simplicity, visual splendor, and emotional punch. Gravity is a cleverly constructed, task-oriented science-fiction adventure, with Sandra Bullock bringing her everywoman appeal to the part of Dr. Ryan Stone, a civilian engineer who’s grossly unprepared when the space-shuttle crew she’s a part of gets pounded by debris from a wrecked satellite. Writer-director Alfonso Cuarón and his co-writer/son Jonás give Dr. Stone a series of impossible tasks that she needs to perform precisely to survive, and—more importantly—they give her a tragic backstory, which lends weight to her determination to fight for her life. Is this backstory even necessary? Do the Cuaróns parcel it out effectively? I’ll answer the second one first: No, I don’t think they do. Much of the pertinent info about Dr. Stone and her colleagues (including George Clooney’s Matt Kowalski, the crewmember she spends the most time with in the film) is slipped in via awkward conversations that seem even more forced given that this disaster strikes toward the end of the mission, long after most co-workers would’ve had the basic “so who are you and where are you from?” chit-chats. As for the first question, I’ll just say that about an hour into the movie, I would’ve called all the personal info about Dr. Stone totally irrelevant to what I believed Gravity to be, which was a straightforward survival tale. And part of me still wants to argue that Gravity could’ve been every bit as pulse-pounding if we never learned anything about Dr. Stone—not even her name. But by the end of the film, as Dr. Stone emerges from a Chinese space capsule and walks unsteadily on Earth again—looking like an alien visitor to her own homeworld—I understood exactly why we need to know who this hero really is, and what she’s been through. Gravity opens with the warning that “life in space is impossible,” which should’ve been my first indication that when the Cuaróns say “space” or “Earth” or even “gravity,” they don’t just mean those words literally. The whole movie is an undisguised metaphor for emerging from the fog of depression to face an unavoidable problem. We have to know about Dr. Stone’s loss so we know what she’s been trying to escape, and how she keeps getting pulled back—first reluctantly, then somewhat triumphantly. Now, because Gravity is partly a metaphor (and one I found deeply moving, ultimately), I’m willing to forgive a lot of its weaker dialogue and narrative lapses. But should I? Tasha, were you bothered by Gravity’s at-times very tenuous plausibility? Tasha: I was, but my plausibility questions mostly pertain to science, particularly aerospace science I know nothing about. I did question the concept of a debris storm, and whether someone could plausibly physically maneuver between the space stations, which all seemed to be occupying roughly the same orbit. And I’m still dubious about the way Dr. Stone finds space deserted, because apparently everybody but her and her colleagues got plenty of warning and just packed up and went home. I didn’t think anything involving space missions happened that rapidly, regardless of hazards. The Cuaróns have talked about the large number of expert consultants they had on this film—they vetted it through NASA scientists, among other things—so I was looking forward to the inevitable spate of “Here’s the real science behind this film, and why its more unlikely plot points are plausible or implausible” articles. Those articles started hitting as we were writing this; here’s Time on why the film is unlikely or impossible. The odd thing is, knowing all this doesn’t bother me. Implausible or exaggerated things happen in films for dramatic purposes all the time. What I wanted to know was whether I should doubt these things, or if I was getting distracted for no reason. Knowing what’s inaccurate about the film just means I can appreciate the choices the Cuaróns made for narrative purposes, and relax and enjoy the film for what it is. I’m reasonably versed in how people react to crises, though, so the backstory and its introduction didn’t throw me at all. Yes, Stone and Kowalski had been on the mission together for a while, but the story of Dr. Stone’s dead daughter isn’t “‘So who are you and where are you from?’ chit-chat,” it’s a central trauma of her life, one she’s trying to escape. It makes perfect sense to me both that she wouldn’t normally tell people about it—particularly co-workers, particularly people she’d be spending a lot of time in close quarters with, possibly without wanting their pity and worry, or her grief reflected back at her—and that it’d weigh heavily on her mind in a traumatic situation where she’s just escaped death, and remains in constant mortal danger. Especially the almost toneless way she describes the simple ease and finality of daughter’s death—“And that was that,” effectively. In that moment, she’s setting up how easily, how finally, how unremarkably she could die as well. Coming where and how it did, okay, that revelation does feel a little like Phoebe Cates’ dead-dad-at-Christmas reveal in Gremlins. Nonetheless, it seemed utterly believable to me that a terrified person in the midst of experiencing incredible trauma would have death on her mind, and would finally spill the story she’s potentially been tamping down for years. And I think the backstory (and a name, and an identity) are absolutely necessary, both to establish the metaphor you describe, and to humanize Dr. Stone quickly and completely, to give viewers a stake in her survival story. In fact, I admire Gravity immensely for the unusual direction the Cuaróns chose. They might have given her a living daughter to survive for, complete with emotional cuts to photos or videos of the kid, encouraging us to imagine her waiting at home for mommy to return. That would have raised the stakes, but made for a much more conventional and openly manipulative story—yet another noble movie-mommy living for her kids, not herself. But when I was actually watching the film, story construction and metaphor weren’t much on my mind. I passed up opportunities to see this film for a month because I wanted my first experience with it to be in IMAX 3-D, and having seen it that way, then watched clips in 2-D, I’d say this is the first film I’ve ever seen where the 3-D and the biggest screen possible are critical, to the point where people who watch it at home in 2-D will be seeing an entirely different movie. It’s meant as an immersive experience, not an analytical one. Did your concerns come after the fact, or did they overwhelm the actual viewing for you? Noel: I was so caught up in the sweaty-palmed “How is Dr. Stone going to get out of this mess?” worry that I wouldn’t say anything really took me out of the movie. I couldn’t help but cringe a little at some of the dialogue, but since so much of the film consists of characters tumbling out of control in the icy blackness of outer space, it’s hard to linger too long over the occasional clunker line. And yet, once I realized that this is really a movie about Dr. Stone’s “return to Earth” in a larger sense, I found that even the implausible moments that aren’t a daydream didn’t bother me as much. Gravity is an effectively nerve-wracking thriller with a hard-science foundation, but it doesn’t need to be taken literally to be enjoyed. Tasha: I suppose you can say any disaster movie is a metaphor for people fighting their way back to internal terra firma after a life-changing shakeup, but that doesn’t change the fact that there are some lousy, boring, thoughtless disaster movies out there. As with any film, the metaphor doesn’t matter if the film isn’t compelling. Sometimes that just means it needs to be emotionally convincing—Upstream Color comes to mind as a story where the acting and the feeling of the film carry the metaphor even when the reality of the story is opaque. But that film is more skewed toward pure metaphor, whereas Alfonso Cuarón makes a point of grounding Gravity in realistic detail from the opening shot—the way objects move in zero gravity, the jargon-y back-and-forth between Kowalski and Houston, the immaculate detail of the Earth as seen from space, the minute focus on Dr. Stone’s plodding progress in changing out a non-functioning Hubble component. It doesn’t need to be taken literally in all its particulars, but establishing the solidity of the situation is one of the primary ways Cuarón sets the stakes. This is, after all, a world almost entirely created via computer-generated images, and it’s too easy to make those worlds feel lightweight and unreal. It’s necessary to make audiences believe in the world, and in Dr. Stone, right up front. And when Cuarón does choose to break with reality, he does it overtly, with clear signals to the audience. I thought it was clear from the start that Kowalski’s reappearance was a dream sequence, both because Dr. Stone survived, unprotected, in a depressurized cabin when he hopped into the capsule, and because the real Kowalski was much too space-savvy and dedicated to NASA protocol to cavalierly open the capsule while she was inside with her helmet off. (Just in case there are viewers who think Dr. Stone could maybe survive, y’know, just a little vacuum exposure, there’s that film-opening text about how life in space is impossible.) George Clooney tips his hand in that scene too, with a too-bright, too-forceful line delivery that’s noticeably less laid-back and sedate than he is in the rest of the film, even in peril. It would have been so easy for Cuarón to fully fake out the audience in that sequence, and then pull the rug out with the it’s-all-a-dream reveal, and I love him for playing more fairly with the audience, and indicating from the beginning that we aren’t seeing a miracle, that he’s dropping the reality barrier for a moment. But I feel like we buried the lead on this film, by launching with the nitpicking about the one specific backstory moment and the science. And I’m seeing other reviews doing that as well—taking it as a given that everyone’s already aware that this is a fantastic, groundbreaking, breathtaking film, and bypassing the praise in order to leap straight into the caveats and exceptions. When you say “the visual design is masterfully conceived and executed” above, you even drop it in as a parenthetical aside. Can we take a moment to fully acknowledge that, regardless of plausibility or the finer points of narrative design, this is a terrific movie? Noel: Oh, absolutely. I understand the impulse to nitpick, especially when a movie arrives so widely acclaimed. Some critics want to tap the brakes, and not let a film race straight ahead to the “new classic” level. But I’d be very surprised if Gravity isn’t embraced by audiences and doesn’t become a perennial favorite. It has such a one-of-a-kind premise—the kind that captures people’s imaginations—and it’s so relentless in the way it’s dispatched. Plus, it builds to a moment of emotional release, designed to send viewers out feeling moved and satisfied. It isn’t a “difficult” film. Yet what I really love about Gravity is that for all its intensity, it has moments of beauty and wonder. When the crisis begins, Cuarón is very good about establishing the geometry of the action—how far Stone is from Kowalski, and how far they both are from any kind of fixed, orbiting spacecraft—such that even when they’re not spinning out of control, they still seem small and dangerously alone, dwarfed by the infinite. There’s a moment when Stone and Kowalski are barely within visual range of each other, and they look like lights in the darkness, indistinguishable from the stars. Later, when Dr. Stone gets to a safe space, she sheds her spacesuit and spends a few seconds just floating. And after that, in another moment of stress, she cries, and her tears drift upward, as they would in zero G. Throughout Gravity, the Cuaróns never lose sight of Dr. Stone’s very real sense that, as she puts it, “I’m going to die today.” This is a movie about expensive technology and a catastrophic event, but it’s always seen through Dr. Stone’s eyes. Tasha: For me, what makes it exceptional is that all the beauty and wonder comes with such a sense of built-in menace. That opening shot finds the characters making their way through an ordinary work day, but in an environment charged with vertigo, with the constant seeming threat of falling hundreds of miles to the Earth’s surface. Cuarón immediately establishes the lack of “up” or “down” in zero G, in the process disorienting the audience and setting a baseline level of knuckle-whitening terror—while making the point that this is very nearly old hat to the characters. This is why I think the movie plays best in 3-D and on the biggest screen possible, because in that environment, the depth of space seems ready to consume not just the characters, but the audience. Something that fascinates me about the film is how Cuarón opens with sequences that emphasize the space around the characters, but then moves into smaller and smaller spaces as the film progresses—the immediate environs of the ISS, the enclosed complexes of the two space stations, the tiny bubble of the Chinese escape pod. For me, this came close to being a flaw, since so much of the novelty and fear factor of the film is based in the danger of the void, to the degree that for me, Dr. Stone felt safer as the movie progressed. Somehow, the threat of death in a small pod with comforting, containing walls all around her felt less innately horrible than the earlier threat of spinning off into infinity, alone. But maybe that’s just me. So let’s wrap up by talking about the ending of the film. I think the Cuaróns made a particularly smart decision by making it entirely unclear where on Earth Dr. Stone landed, subtly making the point that it doesn’t matter at all where she is, as long as she isn’t in airless space. That shot of her emerging from the water—being symbolically reborn, right down to slowly learning how to walk again—is so primal, and her surroundings are suitably primal as well. I’m not sure I would have entirely bought the argument that Gravity is a metaphor if not for this final sequence, which takes the film out of the detail-grounded, science-driven place it operates in for most of its length, and into an arena of simple, naked emotion and sensation. It’s a reversal of everything we’ve seen so far—a warm, wet, womb-like environment instead of a cold, sterile one; a lush, primitive, wild place instead of a wholly manmade one; a place of abundance and fecundity instead of a place of limitation. It all feels more symbol than reality. How did you process the ending? Noel: Much the same. Dr. Stone returns to Earth and immediately starts sinking, until she sheds the encumbrances that are dragging her down. So in the end, it’s not just that she’s “come down to Earth” in the metaphorical sense, but that she’s also unburdened from the weights that will drown her. You mention her emerging from a womb, which is a fair way to describe that last scene of her coming out of the sunken capsule. It also fits with the recurring umbilical imagery. Dr. Stone spends long stretches of the movie either ensnared in cords or actively tethered to people and machines, often needing more than anything to cut herself loose. But when she crawls onto the shore, she also resembles some kind of evolved organism, taking its first steps onto the land. And that matters too, because the central metaphor in Gravity doesn’t just apply to Dr. Stone choosing to live with her personal pain, but to the improbability of life itself. She survives in part thanks to a string of lucky long-shots, which is how most experts view the origins of life on Earth. She has to learn to respect that miracle, and, as Kowalski puts it, ‘Enjoy the ride.’"
Tasha: I’m just fine with enjoying the film rather than enjoying a joke about the film, or at the film’s expense. I wonder how it’ll play upon subsequent viewings, watched more for the craft than that sweaty-palmed oh-God-what-now? experience you mentioned. I wonder if there will come a time when its special effects look dated and primitive. (Though looking back, a surprising number of the special-effects-driven movies that were really groundbreaking in their day still hold up.) But for the moment, I’m perfectly content to give this film the slack-jawed, awestruck wonder it’s earned. Okay, maybe just one pun: Gravity really pulled me in.